APT Industries' custom designed and engineered air handling units provide an economical, energy efficient, quality constructed unit to meet specific HVAC application requirements. 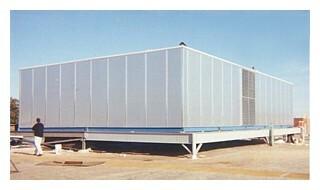 Unit housings are constructed from APT-O-LITE™ insulated panels, built-up from an insulated, structural steel base. Custom design and factory fabrication permit unlimited selection of internal air washers and/or other unit components and configurations necessary to satisfy the needs of a particular project. Units can be either factory assembled in single modules or in multiple modules to be field connected and can be utilized in either indoor or outdoor installations.